An international team of scientists led by University of Hawai'i at Mānoa Professor Ralf I. Kaiser, Alexander M. Mebel of Florida International University, and Alexander Tielens of Leiden Observatory in the Netherlands, discovered a novel chemical route to form polycyclic aromatic hydrocarbons (PAHs) -- complex organic molecules such as naphthalene carrying fused benzene rings -- in ultra-cold regions of interstellar space. The team announced their findings in the January 3 issue of Proceedings of the National Academy of Sciences. Funding for the study was provided by the U.S. Department of Energy, Basic Energy Sciences. On Earth, PAHs are as­so­­ci­ated with in­­­com­­­­­­plete com­bus­tion processes and can be formed readily at elevated temperatures in combustion engines of cars and in cigarette smoke. Once liberated into the am­bient environ­ment, PAHs can be transferred into the lungs by inhalation and are strong­­­­ly implicated in the de­gra­da­tion of hu­man health, particularly due to their high carcino­ge­nic risk po­­ten­­tial. PAHs are also se­rious water pollutants of marine ecosystems and bioaccumulate in the fat­ty tis­­­­sue of living or­ga­nisms. Together with leafy ve­ge­tables, where PAHs de­po­­sit easily, they have been further link­ed to soil contamination, food poisoning, liver lesions, and tu­mor gro­wth. 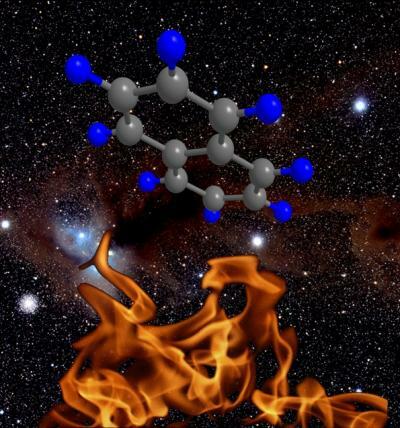 Scientists have been researching the formation of PAHs in combustion flames and in the interstellar medium for decades, but the formation mechanism of even the simplest PAH pro­to­type -- the naphthalene molecule (C10H8) as present in earthly mothballs -- has remained an open question. Textbook knowledge postulates that classical reaction mechanisms involve complex reactions following hydrogen abstraction and acetylene addition (HACA) sequences with substantial 'activation energies.' These processes can only operate at high temperatures of a few 1,000 K as present, for instance, in combustion processes and in the outflows of carbon-rich stars and planetary nebulae. However, in recent years it has become quite clear that interstellar PAHs are rapidly destroyed in the interstellar medium upon photolysis, interstellar shock waves driven by supernova explosions, and energetic cosmic rays. The destruction time scales are much shor­ter than the timescale for injection of new material into the interstellar medium by carbon-rich Asymptotic Giant Branch (AGB) stars and carbon-rich planetary nebulae as the descendants of AGB stars. Therefore, the ubiquitous presence of PAHs in the interstellar medium implies a cru­cial, previously unexplained route to a fast chemical growth of PAHs in the cold environment of the in­­terstellar medium at temperatures down to 10 K, where the classical HACA reaction mechanism cannot function, since entrance barriers (classical 'activation energies') cannot be overcome. To unravel the formation of naphthalene as the simplest representative of PAHs, University of Hawaiʻi at Mānoa chemists Dorian S.N. Parker, Fangtong Zhang, Seol Kim, and Ralf I. Kaiser conducted gas phase crossed molecular beam experiments in their laboratory and presented that naphthalene can be formed as a consequence of a single collision event via a barrier-less and exoergic reaction between the phenyl radical and vinylacetylene invol­ving a van-der-Waals complex and submerged barrier in the entrance channel. Angular resolved mass spectrometer measurements of the reaction products together with isotopic labeling confirmed that naphthalene plus a single hydrogen atom, were produced. To support the derived mechanism involved in the formation of naphthalene, theoretical chemists at Florida International University (Alex Landera, Vadim V. Kislov, Alexander Mebel), merged the experimental results with theoretical computations. Theoretical computations also provide the three-dimensional distribution of electrons in atoms and thus the overall energy level of a molecule. Mebel's computations showed that naphthalene is formed from the reaction of a single phenyl radical colliding with vinylacetylene. Most importantly, since the temperatures of cold molecular clouds are very low (10 K), the computations indicate that the reaction has no entrance barrier ('activation energy').